CAMBRIDGE – The idea of female genital mutilation (FGM) may seem like a foreign concept to many Cambridge residents, however on Feb. 12 the screening of the 30-minute documentary, ‘A Pinch of Skin’ and the discussion that followed sought to spread awareness about FGM and begin a conversation about a topic that is often silenced. Some 30 or so Cantabrigians of all ages and demographics came together in a lecture hall on the second floor of Sherrill Library, located on Lesley University’s Brattle Campus at 89 Brattle Street to learn more about female genital cutting, or khatna, in the community of Dawoodi Bohras, India. The event transpired over the course of two hours, which included the screening of ‘A Pinch of Skin’, available for viewing on YouTube. The women interviewed for the documentary, created in 2012, wished to remain anonymous in fear of backlash from their community of Bohras. Since the release of the documentary many of the woman have come out of hiding and speak openly about their experience with khatna and against female genital mutilation. 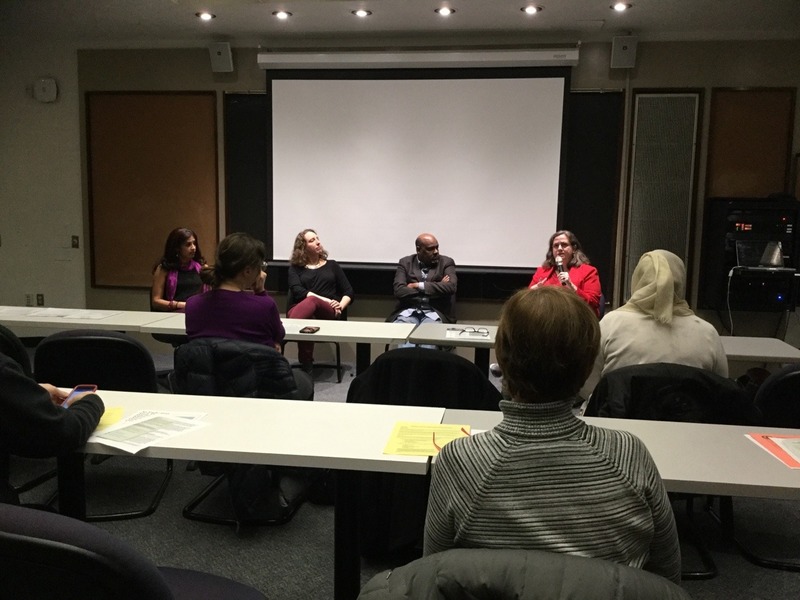 Writer and social activist Mariya Taher moderated the discussion that followed the screening and the panel consisted of Attorney Joanne Golden, community health leader Abdirahman “Abdi” Yusuf, and gynecologist Melody Eckardt. Eckardt takes care of patients who have had this procedure done and also spoke to how the medical community is handling treatment to those who have lived through female genital mutilation and if the healthcare field in the United States, and in Massachusetts, is prepared to handle this. A large legal issue that Joanne Golden speaks to is that this is a procedure “being done to children who cannot consent.” Golden seeks to disband misinformation about the illegal practices of female genital mutilation and notes that the first part is education and community outreach. She wanted to emphasize that this is an issue that impacts Massachusetts as she works to create a state bill that makes the practice of female genital mutilation illegal in our state. While FGM is a religious practice for those in Bohras as they seek purity, the practice does not hold religious significance in Somalia where Abdi Yusuf is from, rather it is a part of an “unquestioned tradition.” He speaks to the politics of gender discrimination, saying that FGM is “done for the benefit of men” and that it “stems from an understanding that women should not have sexual pleasure. The screening and discussion were a part of a larger, ongoing Violence Against Women Initiative at Lesley University which seeks to educate and spread awareness about gendered oppression. A series of monthly events that are free to the public will lead up to the two-day long conference from Nov. 8 to 9, Violence Against Women: Representations, Interpretations, Exploration, and Education.